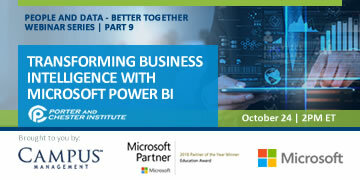 Discover how to gain greater insight into student and operational performance with Microsoft Power BI and CampusNexus Student. Join Brian Boyce, Chief Information Officer, Porter and Chester and YTI Career Institute for a demo and real-world applications of this powerful tool. Learn how people and data are working better together at this growing institution. Brian is the Chief Information Officer at Porter and Chester and YTI Career Institute. He is currently leading the school’s initiatives to better leverage technology for a more comprehensive student education experience to improve faculty and staff efficacy and measure business objectives through data visualization. Prior to leading the IT department, he was the Executive Director of the Westborough, Mass. campus, and has led courses in computer science and chaired the Computer department at Porter and Chester. Brian has over 20 years of experience in primary, secondary and post-secondary education.